LONDON (BLOOMBERG) - Amid the wild Bitcoin ride that's wiped more than 40 per cent off the cryptocurrency's price in a month, a pattern may be emerging: sellers are switching out of digital gold and into the real thing. Bullion dealer Sharps Pixley, a subsidiary of Europe's largest precious metal coin and bar outlet, regularly sees trades north of a million pounds, while sales of gold coins at Frankfurt-based CoinInvest jumped fivefold as the largest digital asset collapsed after surging 1,400 per cent last year, according to Director Daniel Marburger. "Yesterday was a hell of a crazy day," he said from Frankfurt. "Emails and phones did not stand still with customers asking how they could turn their crypto into gold." The current price swings across seemingly every cryptocurrency are bringing to the fore a question that has loomed over the industry since its inception: to what extent can a virtual asset be a store of value? By swapping out of digital gold and into the real thing, some investors may be providing an answer. Ross Norman, a gold dealer with a store tucked in a corner of London frequented by the upper classes, started exchanging gold for bitcoin via an intermediary three months ago. He describes his customers as almost embarrassed by their new-found fortunes. They often store it in safety deposit boxes in his underground vault, following extensive due-diligence to prevent money laundering. "We're seeing trades north of a million pounds every couple of weeks," said Norman from his shop in St James's St. "It's been a welcome addition to our business in a period when physical demand from more traditional sources has been subdued." Customers as young as 25 come in carrying laptops holding bitcoin they accumulated when it traded at US$1 or below. One, Norman said, had 1,000 bitcoin he intends to turn into physical metal. The company, owned by Degussa Goldhandel GmbH, doesn't take possession of bitcoin. Customers buy via an intermediary. "Bitcoin is a bit of a lobster pot - it's easy to get in, but hard to get out," Norman said. "Gold also offers investors 4,000 years of history as a store of value, and that's looking quite appealing right now." Lack of demand hasn't proved much of a headwind to gold prices in recent weeks. The yellow metal, supported by a falling dollar, rallied 7.5 per cent in the past month to a four-month high before tempering gains. Bitcoin fluctuated on Wednesday, but was about 43 per cent lower than its peak in December. Marburger said CoinInvest sold almost 30 kilograms of gold, worth US$1.2 million in the spot market, as bitcoin dropped 23 per cent on Tuesday. One bitcoin buys about eight one-ounce Britannia gold coins, he said. It was a similar story at GoldCore Ltd, where clients have been diversifying away from cryptocurrencies and into physical gold in both bars and coins, according to Director Mark O'Byrne. 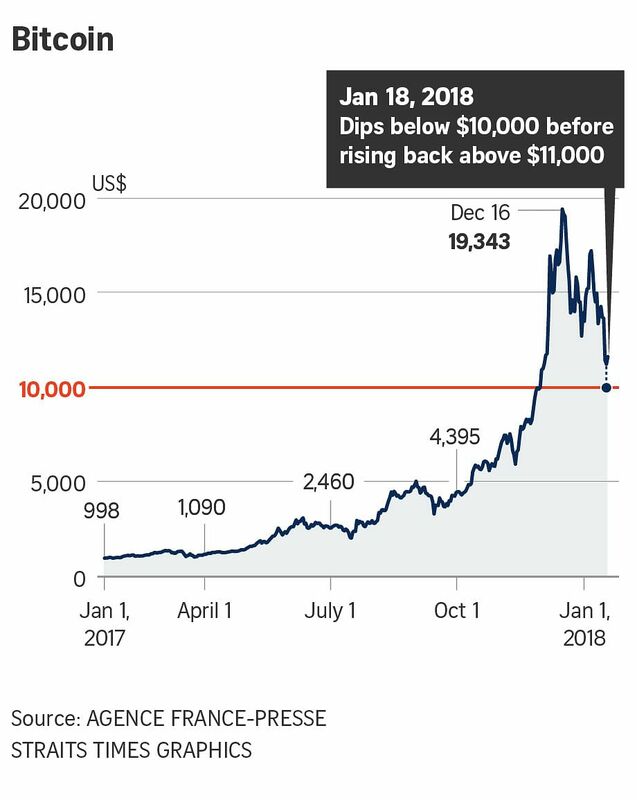 "They told us they were concerned that the massive price appreciation was unsustainable and they got nervous about it," he said in an emailed note. "We think increasingly people are realizing that these digital assets have much higher risk levels than the traditional safe haven asset." But Marburger at CoinInvest says physical gold bullion also holds attraction for bitcoin investors because the assets have much in common. "Both are limited in quantity, easy to trade and you can store them decentralized," he said. Gold has advantages because there are "no passwords you can lose, the volatility is much lower, sustainable growth and in the end you can hold your investment in your hands," he said. Bitcoin dropped below US$10,000 on Wednesday and was trading 4.8 per cent higher at US$11,234 at 4:5pm New York time. It reached a record high of US$19,511 on Dec 18. Gold was 0.8 per cent lower at US$1,327.